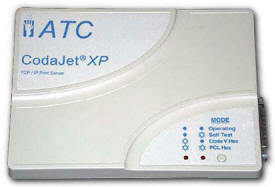 ATC�s new CodaJet XP Print Server is an enhanced replacement for the CodaJet MIO plug-in controllers used in HP LaserJets but provides faster, high-resolution throughput. *The only requirement is your printer be PCL 5e compatible or higher. It features an Ethernet 100BaseT input port and a bi-directional parallel output port. Its powerful RISC processor performs a Code V to PCL conversion but is transparent to PCL data. It simplifies the generation of high-resolution bar code forms and labels in response to QMS Magnum� Code V (VGL) data streams extensively used in main-frame and mid-range systems. In addition to a multiple-format download, �fill-in-the-blanks� function, a new CodaJet feature enables a remap of the variable data strings in a legacy data file into an entirely new format that is stored in the printer. Complex forms and labels are generated with minimum data transmission to the printer providing higher printer throughput. 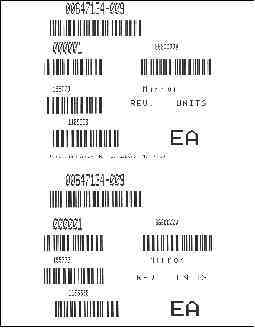 Fifty-two bar code types including popular two-dimensional codes are supported. The CodaJet XP serves as a filter in the printer data stream that is transparent to PCL data but responds to the Code V ASCII printable command sequences identified by a "trigger character". Its fast RISC processor translates the Code V commands to PCL graphics for drawing by the printer. The new programs provide more attractive, faster, high-resolution print compared to previous CodaJets and facilitate use of the LaserJet�s fonts in Code V mode. The CodaJet XP is supported by many popular WYSIWYG label software packages including TL Ashford� in AS400 applications and Strandware LabelMatrix� , Teklynx Labelview� and Loftware for PC and server applications. Supports Any Laser Printer or MFP with HP4 PCL5E or higher emulation. Encode and Annotate 52 Bar Code types: Including two dimensional PDF417, Maxicode and Data Matrix - Automatically includes check sums and human readable characters as desired. Vary bar height to 9.9 inches and narrow element width over 135/1 range. Choose from four fonts placed above or below the symbol in vertical or horizontal orientation. Intermix Printer Resident Fonts with Code V Fonts: Embed Code V Commands in MS Word or other Office files. Character Scaling & Rotation: Vary character height and width independently from 0.025 to 9.9-inches in any of four orientations. Lines & Boxes: Print variable thickness solid or dashed lines and boxes anywhere on the page. Forms & Label Generation with Buffered Forms Loading: Define format consisting of fixed and variable alphanumeric data-fields and bar code fields. Download format and printer will continue to print as each set of variable data is received. Reuse any input data string in multiple print fields. Increment/Decrement Variable Fields in Nested Loops. Reformat Previously Defined Labels Whose Format Data Cannot be Changed: Re-map variable data strings within a legacy format data stream into a new format stored in printer. Reuse any variable data string in multiple print fields and new bar code types in the new format. Repetitive Forms Print with Auto Increment: Label formats may be repeated across and/or down the page while simultaneously incrementing or decrementing number fields and bar code values. Normal, Reverse Printing: Print white on black background on any or all characters. Bit Addressable Graphics for Logo Download. Select Operating Parameters such as IP Address, trigger character, narrow bar size, hexadecimal printout, character shape, international character set, store/clear formats, etc., using Print Control Utility software supplied with the module. Data Capture: Capture ASCII input or PCL output of converter for ease in troubleshooting. Push Test Button on top of CodaJet XP for Hex-ASCII dump to Printer. Auto Sensing 10/100 BaseT Input: or force speed selection by switch setting. Output to a Parallel Printer or LAN Printer. Physical Size: Small 5.5 x 7.5 x 1.25-inch module has RJ45 10/100 BaseT and DB25 IEEE 1284 compliant connectors. Operating Voltage: 5-VDC @ 2.5-Amp from 110-220-VAC Universal Power Supply furnished with module.